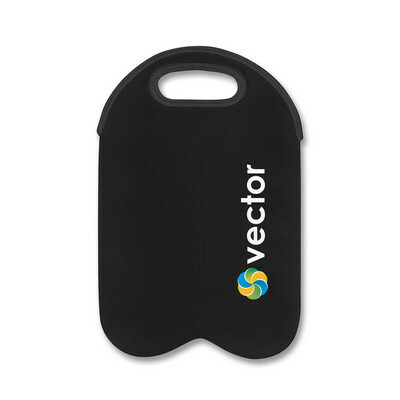 Neoprene carry bag with reinforced handles for keeping a bottle of wine cool while in transit. Colours: Black. Dimension: W 120mm x H 365mm x 10mm. Print Description: 80mm x 180mm (one colour). Print Type: Screen Print. Packing: Loose packed. 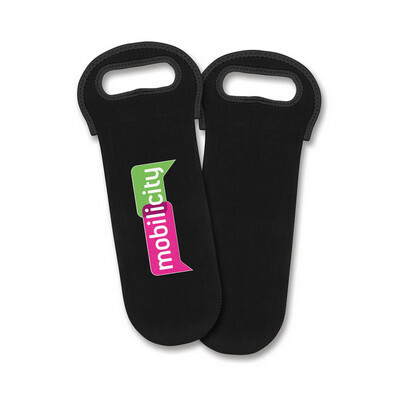 Neoprene carry bag with reinforced handles for keeping two bottles of wine cool while in transit. Colours: Black. Dimension: W 245mm x H 365mm x 10mm. Print Description: 80mm x 180mm (one colour, left or right side). Print Type: Screen Print. Packing: Loose packed. 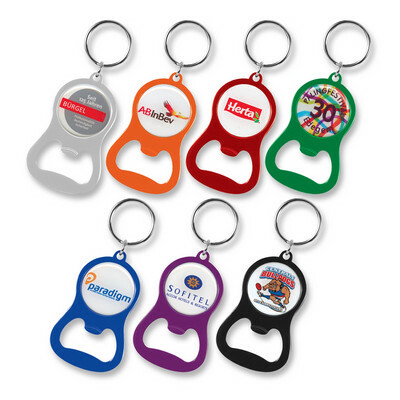 Metal bottle opener with a key ring which can be branded with the choice of a resin coated finish or oxidised White laser engraving. Colours: Silver, Orange, Red, Green, Blue, Purple, Black. Dimension: W 40mm x 65mm x 3mm (Dia 25 mm ring). Print Description: 25mm circle (front and back). Print Type: Laser Engraving. Packing: Loose packed. 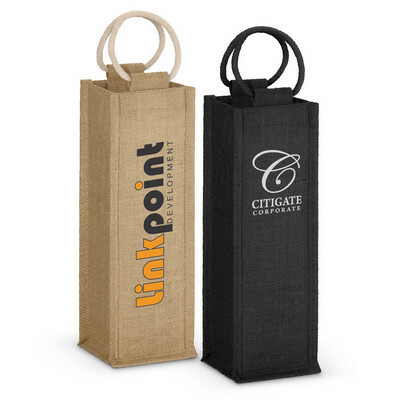 Two bottle wine carrier manufactured from environmentally friendly, laminated natural jute with unbleached woven cotton handles. Colours: Natural, Black Dimension: H 350mm x W 200mm x Gusset 105mm (excludes handles). Print Description: 120mm x 250mm. Print Type: Screen Print. Packing: Loose packed. 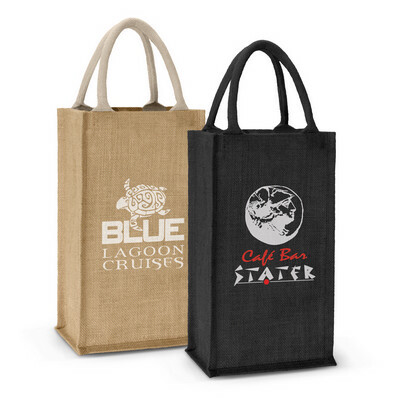 Single bottle wine carrier manufactured from environmentally friendly, laminated natural jute with unbleached woven cotton handles. Colours: Natural, Black. Dimension: H 350mm x W 115mm x Gusset 105mm (excludes handles). Print Description: 250mm x 50mm (one colour). Print Type: Screen Print. Packing: Loose packed. 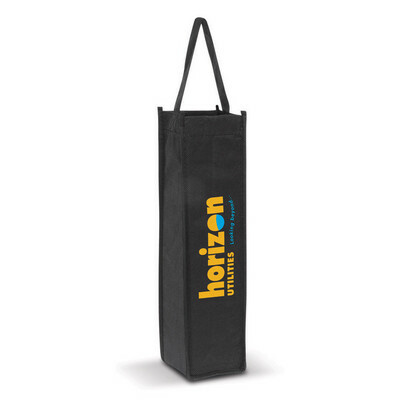 Convenient carry bag for transporting one bottle of wine while keeping it cool. 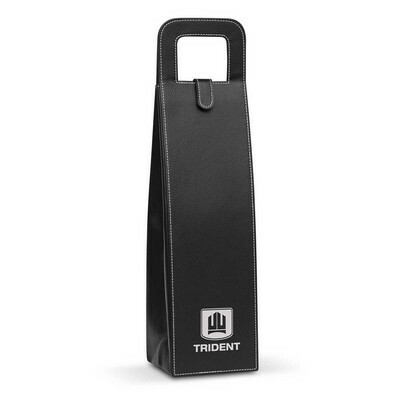 It is manufactured from neoprene which has excellent insulation properties and features smart Black stitched reinforcing around the handles and opening. 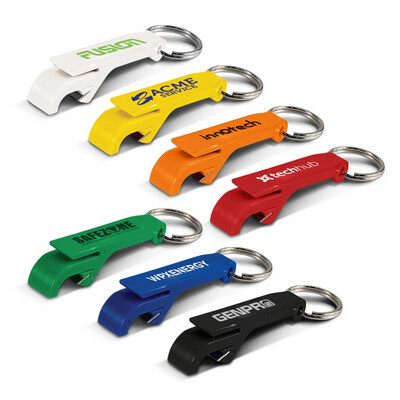 Both sides can be branded in full colour at no extra cost. A lead time of 25 days applies to this product. Colours: White, Yellow, Orange, Pink, Red, Bright Green, Dark Green, Teal, Light Blue, Dark Blue, Navy, Purple, Black. Dimension: W 120mm x H 365mm x 10mm. Print Description: Please ask for a printing template. Print Type: Sublimation. Packing: Loose packed. Less than minimum quantities are not available for this item. MOQ applies per colour on this item. Tote bag that holds one bottle of wine. Manufactured from 80gsm non-woven material. Colours: Black. Dimension: H 325mm x W 95mm x 90mm (excludes handle). Print Description: 55mm x 240mm (one colour). Print Type: Screen Print. Packing: Loose packed. 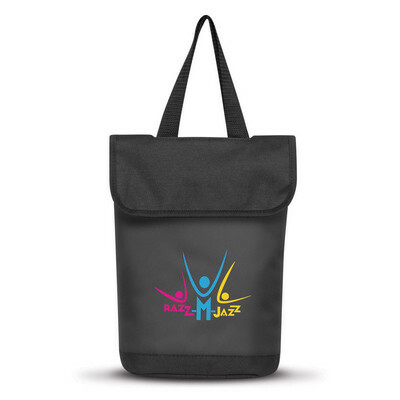 Tote bag with a reinforced base that holds two bottles of wine. Manufactured from 80gsm non-woven material. Colours: Black. Dimension: H 280mm x W 180mm x 100mm (excludes handles). Print Description: 55mm x 180mm (one colour, left or right side). Print Type: Screen Print. Packing: Loose packed. 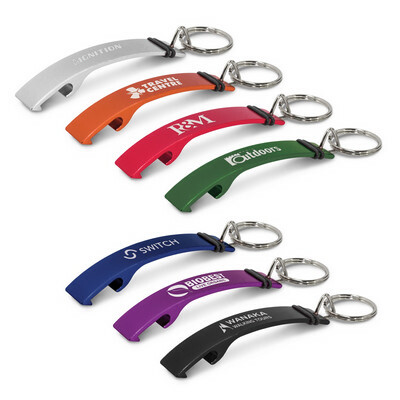 Credit card shaped stainless steel bottle opener with a large branding area. Colours: Silver, White, Red, Dark Blue, Black. Dimension: W 54mm x H 84mm. Print Description: 45mm x 45mm. Print Type: Pad Print. Packing: Loose packed. 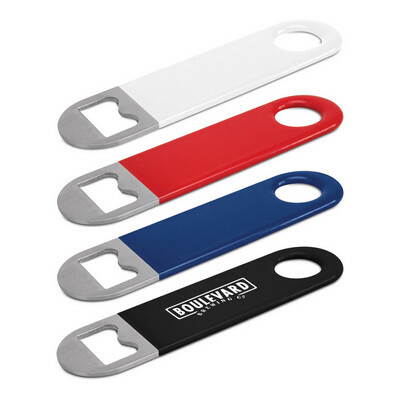 Stainless steel bottle opener with a soft touch vinyl coating on the handle which is available in both small and large sizes. Colours: White, Red, Dark Blue, Black. Dimension: W 30mm x H 120mm. Print Description: 45mm x 25mm. Print Type: Pad Print. Packing: Loose packed. 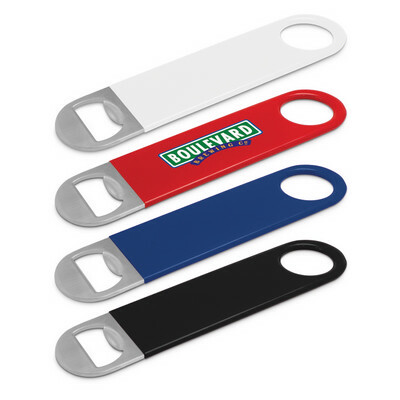 Stainless steel bottle opener with a soft touch vinyl coating on the handle which is available in both small and large sizes. Colours: White, Red, Dark Blue, Black. Dimension: W 40mm x H 180mm. Print Description: 65mm x 35mm. Print Type: Pad Print. Packing: Loose packed. 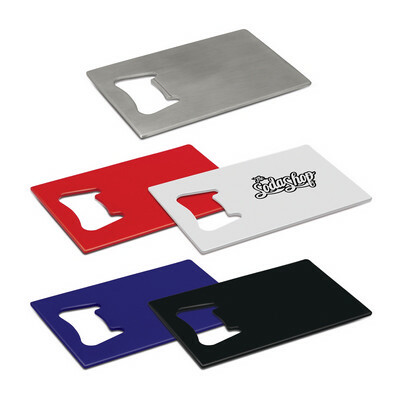 Strong credit card shaped plastic and metal bottle opener with a large branding area. Colours: White, Yellow, Orange, Red, Green, Light Blue, Dark Blue, Black. Dimension: W 54mm x H 84mm. Print Description: 40mm x 40mm. Print Type: Pad Print. Packing: Loose packed. 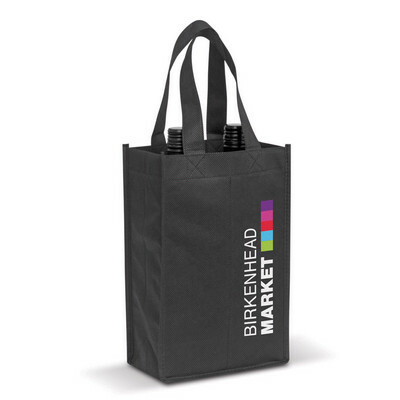 Convenient carry bag for transporting two bottles of wine while keeping them cool. It is manufactured from neoprene which has excellent insulation properties and features smart Black stitched reinforcing around the handles and opening. 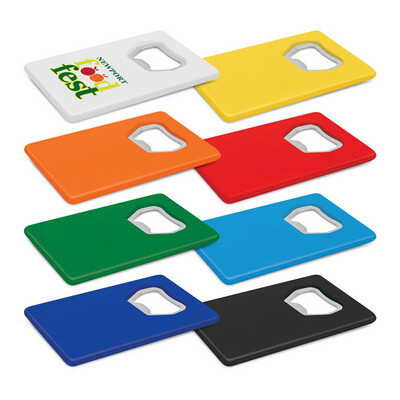 Both sides can be branded in full colour at no extra cost. A lead time of 20 working days applies to this product. Colours: White, Yellow, Orange, Pink, Red, Bright Green, Dark Green, Teal, Light Blue, Dark Blue, Navy, Purple, Black. Dimension: W 245mm x H 365mm x 10mm. Print Description: Please ask for a printing template. Print Type: Sublimation. Packing: Loose packed. Less than minimum quantities are not available for this item. MOQ applies per colour on this item. Multi purpose opener with a soft touch double injected grip. 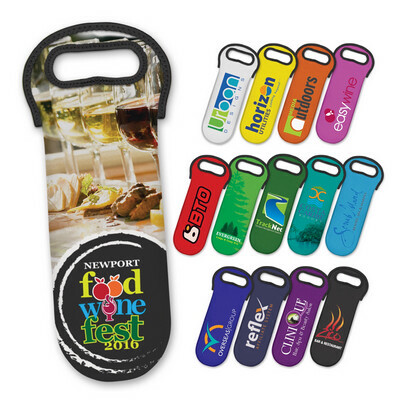 It features a metal bottle opener, a beverage can opener, a twist cap bottle opener and a jar opener. A lead time of 10-15 working days applies to this product. Colours: Red, Green, Blue, Black. Dimension: W 130mm x H 45mm. Print Description: 38mm x 6.5mm. Print Type: Screen Print. Packing: Polybag. Less than minimum quantities are not available for this item. Dual action bottle opener which has strong magnets so it can be stored on a fridge. It features a bottle opener and an opener for twist caps. A lead time of 10-15 working days applies to this product. Colours: White, Red, Lime Green, Blue, Black. Dimension: W 85mm x H 45mm. Print Description: 51mm x 19mm. Print Type: Screen Print. Packing: Cello Bag. Less than minimum quantities are not available for this item. 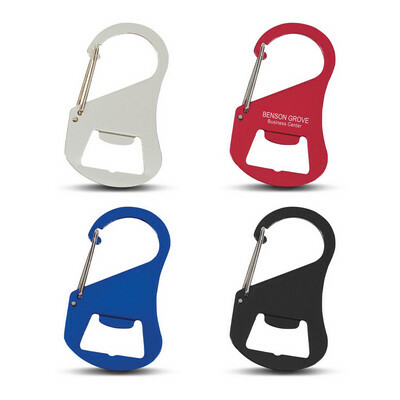 Multi purpose opener for bottles and beverage cans which also has a fold away corkscrew. A lead time of 10-15 working days applies to this product. Colours: White, Red, Lime Green, Blue, Black. Dimension: W 145mm x H 45mm x 13mm. Print Description: 63.5mm x 16mm. Print Type: Pad Print. Packing: Cello Bag. Less than minimum quantities are not available for this item. 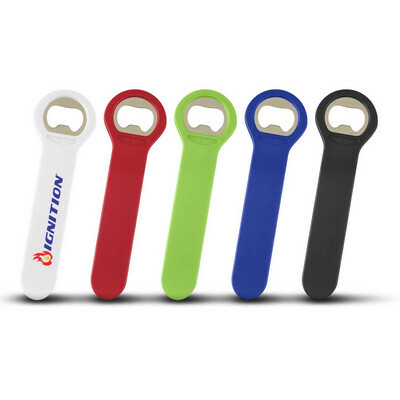 Metal bottle opener which features a long contoured grip for comfort and easy opening. A lead time of 10-15 working days applies to this product. Colours: White, Red, Blue, Black. Dimension: W 130mm x H 30mm. Print Description: 51mm x 9.5mm. Print Type: Pad Print. Packing: Cello Bag. Less than minimum quantities are not available for this item. Flat metal bottle opener with a carabineer clip. A lead time of 10-15 working days applies to this product. Colours: Silver, Red, Blue, Black. Dimension: W 38mm x H 65mm. Print Description: 22mm x 8mm. Print Type: Laser Engraving. Packing: Cello Bag. Less than minimum quantities are not available for this item. 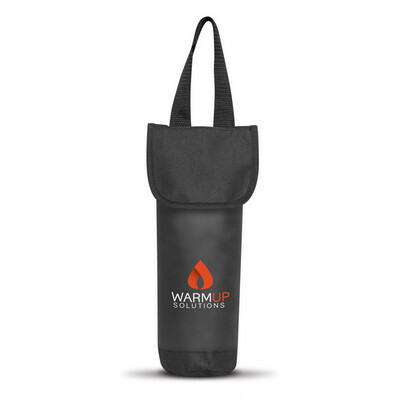 Luxury single bottle wine cooler carry bag. Has a polyester outer construction with PE insulation foam and a waterproof PEVA inner liner. Colours: Black. Dimension: H 300mm x W 135mm x Dia 100mm (excludes handle). Print Description: 100mm x 85mm. Print Type: Screen Print. Packing: Loose packed. 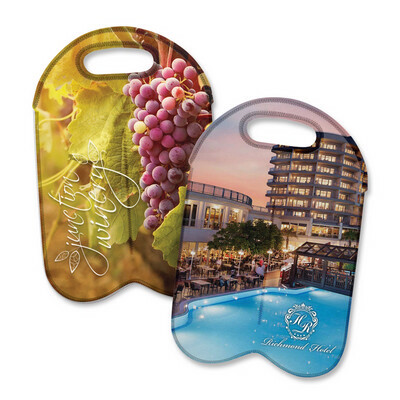 Luxury two bottle wine cooler carry bag. Has a polyester outer construction with PE insulation foam and a waterproof PEVA inner liner. Colours: Black. Dimension: H 300mm x W 230mm x Gusset 100mm (excludes handle). Print Description: 160mm x 120mm (one colour). Print Type: Screen Print. Packing: Loose packed. Leather look reinforced single wine bottle carrier that folds flat for economical transportation. Colours: Black. Dimension: H 418mm x W 105mm x Gusset 105mm. Print Description: 75mm x 260mm (one colour). Print Type: Screen Print. Packing: Loose packed. 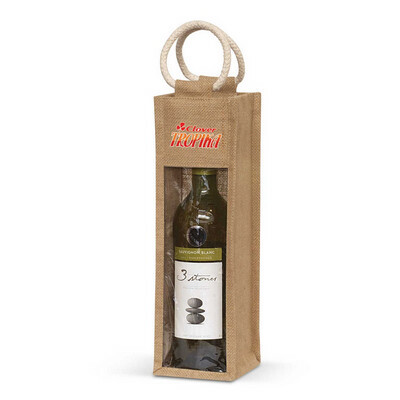 Single bottle, laminated jute wine bag with woven unbleached cotton handles and a clear PVC front panel. Colours: Natural. Dimension: H 350mm x W 110mm x Gusset 100mm (excludes handles). Print Description: Front - 65mm x 35mm. Back - 250mm x 50mm. Print Type: Screen Print. Packing: Loose packed. Robust metal bottle opener with two decorative rubber accents and a key ring. It laser engraves to an oxidised White colour. Colours: Silver, Orange, Red, Green, Blue, Purple, Black. Dimension: W 15mm x L 79mm x 12mm (Dia 24mm ring). Print Description: 32mm x 12mm. Print Type: Laser Engraving. Packing: Loose packed. 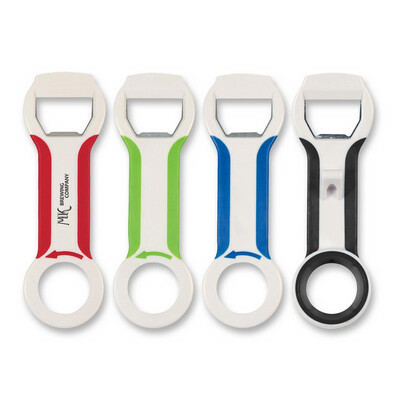 Compact plastic bottle opener with a handy tab slot for opening cans. Colours: White, Yellow, Orange, Red, Green, Blue, Black. Dimension: W 13mm x L 68mm x 16mm (Dia 24mm ring). Print Description: 40mm x 9mm. Print Type: Pad Print. Packing: Loose packed.